Foot eczema causes the skin on the foot to become red, itchy and inflamed. Eczema, also known as dermatitis, is a common condition, particularly in childhood. It affects approximately 10-20% of children, and whilst a majority grow out of it by the age of ten, 3% of adults go on to suffer from eczema periodically. Eczema can affect any part of the foot but most typically develops on the toes, heel, sides and ball of the foot. It usually develops in response to friction, moisture or an allergic reaction. While there is no specific cure for foot eczema, treatment aims to reduce the itching and inflammation and to help the skin to retain moisture. There are a number of different types of foot eczema, the most common being atopic dermatitis. Here we will look at the most common types of foot eczema, what causes them and the symptoms associated with them and then we will go on to look at the best ways to treat eczema. Atopic dermatitis is the most common type of foot eczema. It is a chronic condition, which means it is long lasting. Symptoms often come and go with periods of “flare-ups”. It typically starts during childhood (before the age of two) and in some cases persists through teenage years and into adulthood. Eczema may be quite widespread affecting not just the foot but other areas too, most commonly the back of the knees, hands, front of the elbows and the head. The exact cause of foot eczema from atopic dermatitis is unknown. It is thought to be caused by the immune system over-reacting to certain allergens or irritants, either inside or outside the body, which causes inflammation. People with eczema find that their skin is unable to retain moisture so the skin becomes dry which increases the likelihood of reactions to certain triggers. There may be a lack of filaggrin in the skin, a protein that maintains a healthy, protective skin barrier which stops moisture from escaping and this makes it easier for viruses and bacteria to enter the skin. Studies have shown that nearly 50% of all cases of severe eczema have at least one mutated filaggrin gene. Atopic dermatitis is also more likely if you suffer from hay fever and/or asthma. These three allergic conditions are collectively known as the “atopic triad” and often present together. There is also a suspected genetic link with an increased chance of developing foot eczema and atopic dermatitis if you have family members with any of the atopic triad. 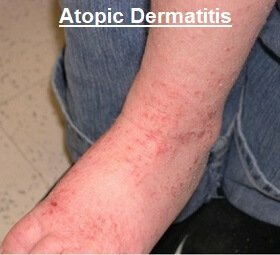 It is important to remember that atopic dermatitis is not contagious, you can’t pass it on to anyone else. Also known as Dishydrosis or Pompholyx, dyshidrotic foot eczema causes tiny, deep blisters to develop on the soles and sides of the feet and the palms of your hand. When it affects just the feet it is called Pedopompholyx. The first sign of dyshidrotic eczema is intense itching of the soles of the feet, sides of the toes and fingers and it may feel like the skin is burning. Tiny blisters then develop which may be filled with fluid. The skin may become infected, especially if you are scratching lots, making the blisters extremely painful and they may start to ooze out pus. In severe cases, large blisters will form. The blisters from dyshidrotic eczema usual clear up after a few weeks – the skin typically dries and cracks as it is healing. Dyshidrotic eczema is thought to be caused by a fungal infection, a reaction to an allergen such as metals or soaps, stress, seasonal allergies and sweating. It usually affects adults between the ages of 20-40 and is thought to be hereditary. Also known as Nummular Dermatitis or Discoid Eczema, this causes patches of coin-shaped spots to develop which may ooze or crust over. The skin around the lesions turns red or brown and becomes inflamed. The spots may or may not be itchy. Nummular eczema may develop in response to skin damage such as a burn or insect bite, inflammation elsewhere in the body, dry skin, poor blood flow or as a reaction to certain metals. There does not appear to be any hereditary link with nummular eczema unlike with other types of foot eczema. It also tends not to be recurring and usually clears up completely within a year. It usually affects men between the ages of 55-65 and women aged 13-25. It can also affect children. There are two types of contact dermatitis. Irritant Contact Dermatitis: which develops when your skin is irritated by a chemical or similar substance. Symptoms of contact dermatitis usually develop very quickly after exposure to the irritant with the skin turning red and itchy and blisters forming which may be filled with pus. You can find out more about both types of contact dermatitis in the foot rash section. Whatever type of foot eczema you have, the treatment will be basically the same, the aim being to reduce the itching and inflammation during a flare-up and to encourage skin moisture in between. There is no cure for dermatitis but there are a number of things you can do to manage it by relieving the symptoms and reducing the chance of flare-ups. Early treatment is vital to prevent symptoms escalating so it is important not to ignore the warning signs of dry, itchy skin. Treatment is important both during and between flare-ups of foot eczema to help to both treat and prevent the condition. Keeping the skin well moisturised is very important with foot eczema. Emollients are medical moisturisers that help to reduce moisture loss from the skin by evaporation and repair its natural protective barrier. Emollients should be used for treatment and prevention both during flare-ups and during symptom-free periods. Generous amounts of emollient should be applied at least twice day when you are symptom-free and more often during flare-ups. Avoid rubbing emollients into the skin, instead gently apply them following the direction of the hairs to prevent any clogging. There are a whole range of emollients out there and you may need to try a few before you find the right one for you. Corticosteroid creams and ointments can help to reduce inflammation. Over the counter medication such as 1% hydrocortisone may be sufficient but in more severe cases your doctor may prescribe stronger corticosteroids. Corticosteroids work best when they are applied around half an hour after moisturising. In my experience, ointments tend to be more effective than creams as they contain more oil, soak in better and are absorbed over a longer period making them more effective at keeping moisture in, but they are greasy. You should continue to use corticosteroids for two days after a flare-up has settled to ensure any inflammation under the skin is fully treated. Using strong corticosteroids for long periods can lead to skin thinning and/or lightening, acne and increased hair growth. These side effects usually settle once treatment is stopped. If the skin has become infected your doctor may prescribe antibiotics to treat the bacteria causing the infection. They may be oral antibiotics or antibiotic cream depending on the infection. Antihistamines help to reduce itching from eczema by blocking the effect of histamines in the blood. 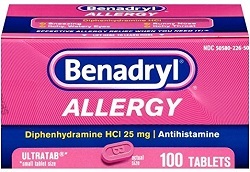 Sedating Anti-histamines: such as diphenhydramine (Benadryl) cause drowsiness and can be helpful if your foot eczema is affecting your sleep. Regular baths and showers can help to reduce the symptoms of eczema but if not done correctly they can make things worse. Bathing (or showering) for 10-15 minutes in lukewarm water helps the skin to absorb moisture, and is also a good way to de-stress. The mantra to follow is “Soak and Seal”. Make sure that you limit soaking to under 15 minutes and that the water is lukewarm, not hot. Avoid scrubbing your skin or using any soaps or solutions that could irritate your skin. Once out of the bath, gently pat dry your skin with a towel leaving it slightly wet. Then generously apply moisturiser all over the body. This should be done within three minutes of getting out of the bath otherwise the skin will actually become drier and more irritated which is likely make your foot eczema worse. Allow the moisturiser to soak in for a few minutes before dressing. 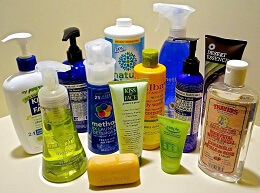 Always use products that are free of perfumes and dyes to prevent any irritation when washing. Wearing special medicated bandages, socks or placing wet wraps over the affected areas of skin can help to stop the area drying out, protect the skin, allow it to heal and prevent scratching. Emollients and/or corticosteroids should be applied first. This can be particularly helpful if your foot eczema bothers you at night as it helps the cream/ointment to be absorbed and stops you from scratching. There are some lifestyle changes you can make to help to reduce the frequency and intensity of foot eczema flare-ups. Dermatitis is just one of the possible causes of foot rashes. Other conditions such as athlete’s foot and psoriasis can cause dry skin and itching which may mimic eczema. Visit the foot rash section to find out more. Remember, managing eczema is a daily thing. It is really important to regularly moisturise even when you are symptom free to stop your foot eczema from flaring up again.